A crowd of nearly 20,000 accumulated once again for the Can-Am All Breeds Equine Emporium in London from March 18th – 20th. They come for the entertainment (with a star studded line up), clinics, shopping and who can resist visiting the EquiMania! attraction. Returning EquiMania! fans were impressed with the fresh look of the displays. The pride Canadians feel for having the youth safety initiative featured at WEG was apparent from visitor comments. 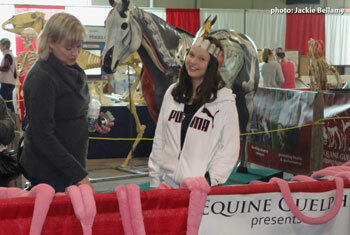 The kids were full of smiles as the volunteers, bearing red EquiMania! shirts, filled their arms full of activities and important take home messages. The newly launched “Danger Detective on the Horse Farm” book was a big hit, boasting 17 pages of games that make learning safety fun. Every visitor wanted one! Gayle Ecker, Diane Gibbard, Jackie Bellamy, Dr. Scott Hie, Carrie Copely, Adam Harrison and the students from Kemptville and the University of Guelph. True to the nature of the attraction- the talks were informative and interactive. 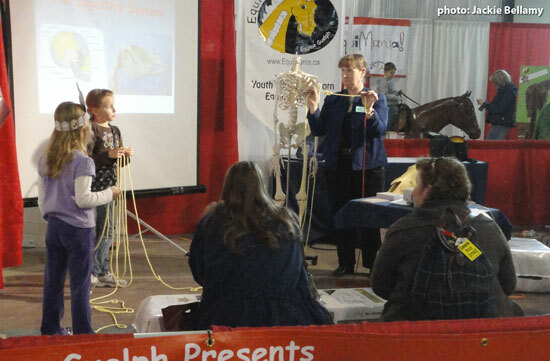 Participants were invited to practice their best whinny, handle simulated intestines and absorb information in a show-and-tell fashion thanks to the industry professionals who donated their time. Equine Guelph congratulates winners of our three raffles: Sam Colyer of Branchton, Ontario, Grace Twiner and Elaine Miller of Dunnville, Ontario. They won polos donated by Pfizer, a cooler donated by Pfizer and an Equine Guelph horse health check basket. Those entering the draw signed up to receive Equine Guelph’s bimonthly E-news informing horse enthusiasts of upcoming events and workshops. One can also sign up on-line at www.EquineGuelph.ca. Equine Guelph thanks all their volunteers and sponsors for another successful year at Can-Am: Kubota Canada, Ontario Equestrian Federation, Pfizer, Shur-Gain, SSG Gloves, Standardbred Canada, System Fencing and Workplace Safety & Prevention Services. EquiMania! and Equine Guelph has a full roster of events this summer and will appear next at the Everything Equine Expo in Uxbridge, ON May 14th.